It’s getting close to Christmas, so it’s time to start thinking about making a few presents. It’s dicy whether I’ll have the chevy operational and the marquetry process sorted out well enough to incorporate that into any presents, but that isn’t really what I want to talk about today. My son, now 14, usually makes presents for relatives. I had him make a list of who he needs to shop (in either sense of the word) for, and what he might buy or make for them. 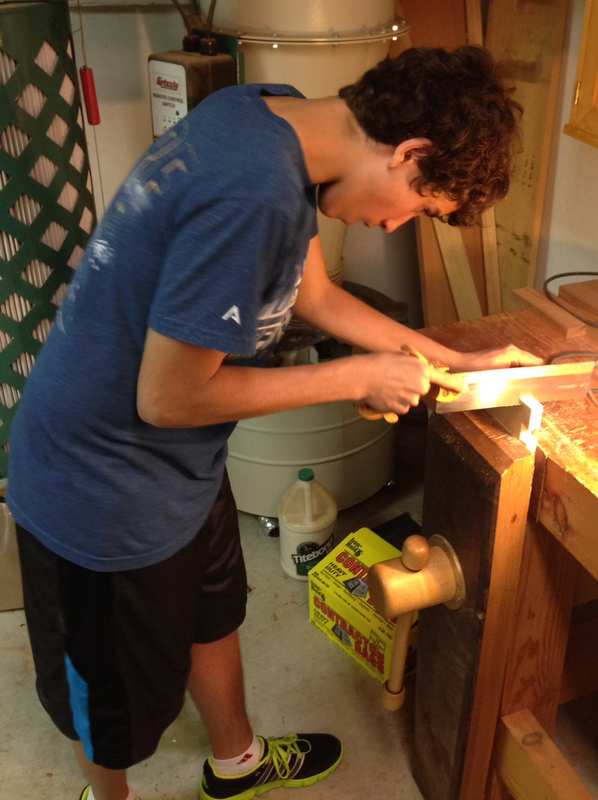 I suggested a dovetailed candle box as one possibility – but he’d need to know how to dovetail first. So off to the shop we went for a dovetail lesson. I had him first make a series of practice cuts with the dovetail way, following the tail layout lines I drew. He did really well. So we dived right in, I had him layout a pair of tails on a board and saw them out. 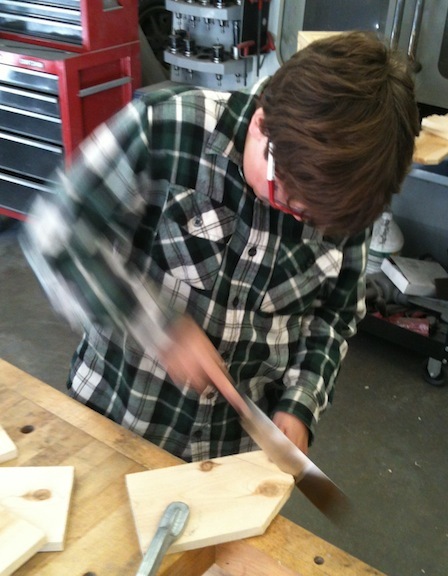 He used a fret saw to cut out the waste, then chopped to the baseline without bruising them. Wow. Short story long, we went through the entire process with him doing all the work and me coaching, and he made a sample joint that was very, very good. It fit snugly with almost no fine tuning, and he did it all himself. 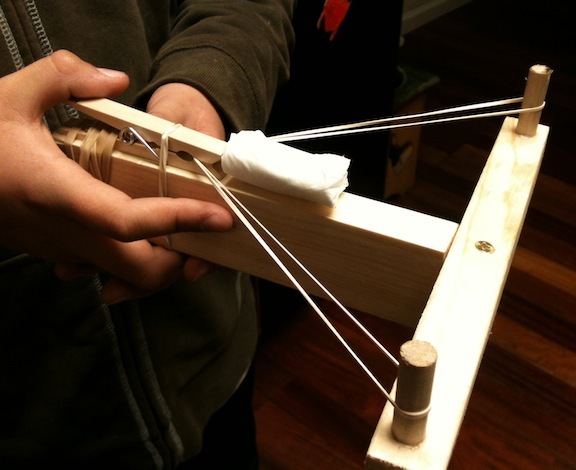 When I think back to how I struggled trying to learn how to do this — although to be fair he did have an excellent instructor (grin) and the right tools. Nice job pal, I’m proud of you! Hopefully this is the first of many posts on making stuff with my son. We’ve done a few projects together, the best was when we forged a knife together. I had a few scraps of O-1 round bar, my son forged this to shape, ground it flat, cut out the brass guard, glued it up and shaped the handle. 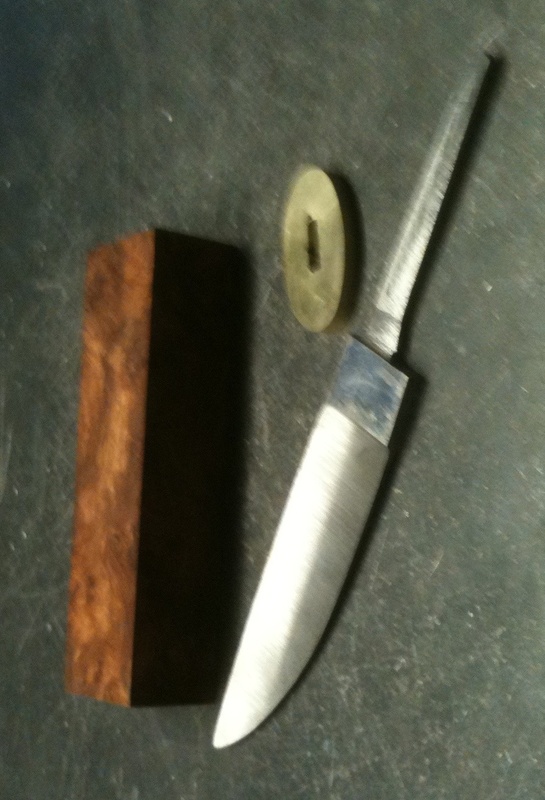 I helped with the heat treatment and hollow grinding of the blade, Kolya did all of the finish work. It came out great and sees regular use in our kitchen. Not bad for an 11 year old kid, he was very proud of it. So, on to woodworking. 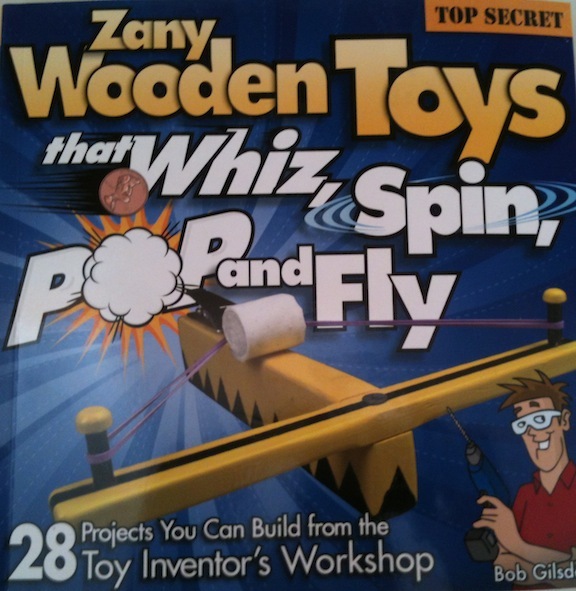 I Googled for kid-friendly projects and found some plans for a bird house. I picked up some cedar fence boards at the local big-box store, some nails, glue and a bit of 3/8″ dowel rod. 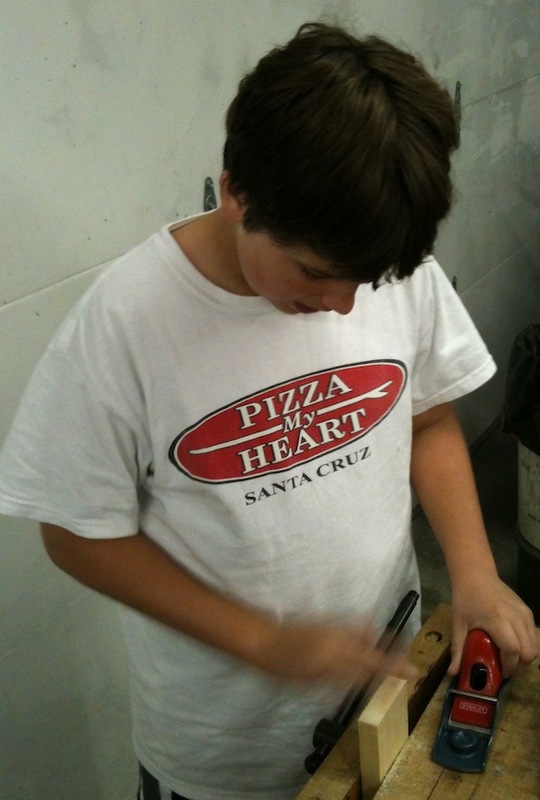 The boards are 5.5″ wide, .5″ thick and 6′ long – with clipped corners on one end. They were also soaking wet, it must have been a tree still within the last week or two. The instructions are pretty straightforward. I helped Kolya and his friend Alec mark out the lengths to cut and they went to town with handsaws. They both did a great job sawing and there was only a little clean up needed. I shot the ends square (square-ish…these are rough sawn boards and there isn’t a true surface anywhere). Mostly I just wanted to make sure things would line up for nailing. 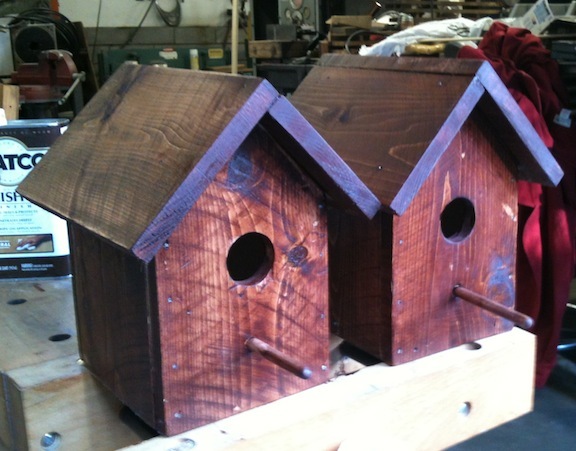 We used Titebond III waterproof glue and some 3D finishing nails to assemble our birdhouses. Now this is funny. Anyone who know me has seen my hammer collection — without exaggerating I bet I have at least 50 hammers. Old auto body and sheet metal shaping hammers, mallets and slappers. 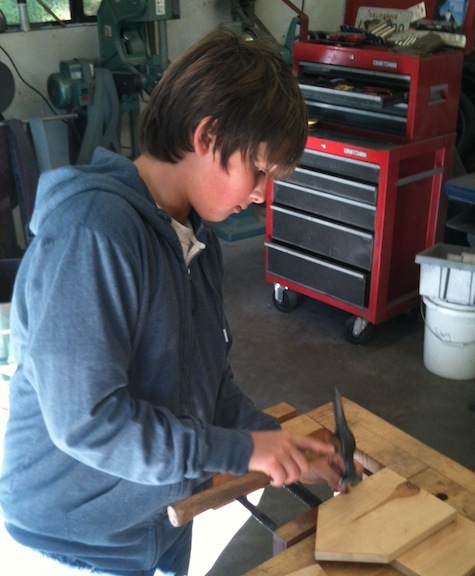 Silversmithing hammers. Inexpensive body hammers that I’ve ground to a special shape for some particular job, semi-rare Pexto hammers I’ve tracked down on eBay, even a custom-forged hammer made to my specifications. Ball peen hammers in every size. Blacksmithing hammers, blocking hammers and plannishing hammers. But I couldn’t find a nail hammer. Seriously. I know I own one that I’ve had since I was a kid, and I know I have a framing hammer somewhere too. Maybe they were out on a date together somewhere. Instead we used a cheap autobody hammer to drive the nails. 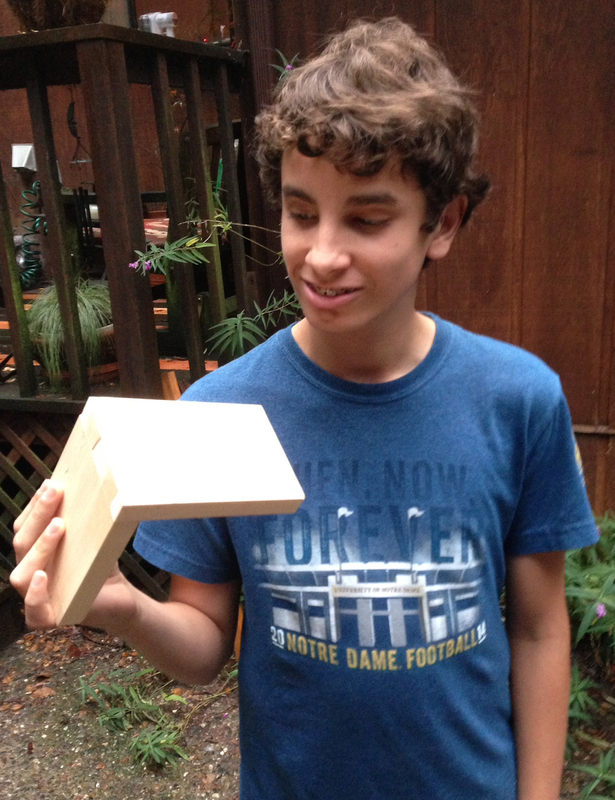 The boys sanded their bird houses with 100 grit paper. Since this is rough sawn wood we just wanted to knock off the splinters and sharp edges. A bird with a splinter is a very sad thing. They enjoyed glopping on a coat of gel stain. I rubbed the excess stain off and we put a coat of danish oil on them. They came our nice I think, and they boys had a great time doing it.